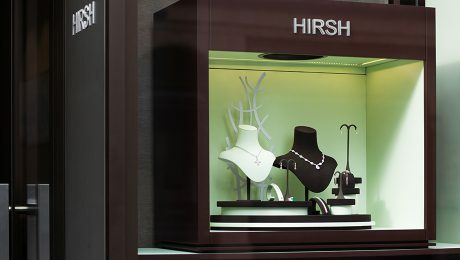 Hirsh London is a family-owned jewellery business who are a diamond specialist, cutting and polishing individual gems to meet the customer’s requirements. On the strength of our previous work with leading jewellery brands, Hirsh London asked us to help develop and grow its existing brand identity. Simple, subtle changes were made to transform the logo’s look-and-feel, and was entirely in keeping with the brand values of precision and attention to detail. We also created a new deep-brown-and-pistachio colour palette echoing the shop’s display fittings and leather wall panels, which we translated across the website and printed materials. We also created a Google-friendly interim website page, pending a future rebuild. Again, our approach was evolutionary, rather than revolutionary, focusing primarily on art direction and image style. By using existing photography more effectively, we gave the site a more premium feel, promoting greater emotional engagement with, and desire for, the products, within an existing structure. At its single store, just off London’s exclusive Bond Street, it designs and makes bespoke jewellery to order. Our brief was to refresh, rather than reinvent, the logo, which we achieved by adjusting the letter-spacing and relationship of font sizes.